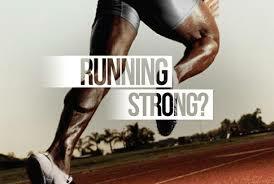 Adding strength training for your body overall is obviously going to help you as a runner. Strength training should be done for 30-60 minutes three days a week. You can do them after your run or on days you don’t run. I recommend the latter. If you can’t go through all of them during the time you have available (this whole program is about 1.5 hours), do some one day and then the others the next. You can even break it up into three shorter sessions and just rotate through them. You don’t necessarily need a gym membership to do these exercises because they use a few free weights, which you can get at any sports store and many general stores. Most of them are inexpensive as well. For runners using free weights, body weight, and plyometrics are going to help you the most. Machines may seem ideal because they are easy and they will help you build strength. The issue is they are stationary and running is not stationary. You are working to strengthen patterns of movement. Here is a list of the equipment you need to complete this comprehensive strength workout: Kettle bell, swiss ball, medicine ball, resistance band (loop) and dumbbells. Many of the exercises we’ve looked at work more than one section of the body making this easier than it looks if you’ve read all of the prior blogs. I’ve compiled the list here for easy access . Please feel free to use this and share it with others. If you can’t remember how to do them, I’ve linked the post with the instructions. I’ve put them in supersets to make it less overwhelming. I string them together so you can move between them easily. To perform a superset complete all three rounds of the exercises in the set and then move to the next superset. Complete 10-20 repetitions of each exercise in each set. If it gives you a time then, do it for that duration three times. Try to move from exercise to exercise as quickly as possible. I highly recommend doing the complete program. It’s going to get you a more rounded and balanced body. However, I’m a realist. If you can only do one part, focus on your core. Here are the links to the core posts, abs, hips , and thighs. We all want to become faster, stronger, and more efficient runners. And even if there are a few who don’t want those things, you still want to be able to run for the rest of your life. The best way to make sure you are able to continue running is to reduce the risk of injury and one of the most effective ways to reduce your risk of injury is through strength training. We’ve been making our way down the body considering how each muscle group helps us become faster, stronger and more efficient runners through strength training and as we’ve looked at each section something that has become a theme is injury prevention. Injury prevention is something all runners can get behind regardless of your distance or where you fall in the pack. We’re all going to get slower as we age and it becomes more difficult to build muscle mass, not that we want a lot of mass as runners, but an area where we can continue to get better and balance out what we lose in strength is efficiency.